Branded Promotional Spinners made a massive impact in 2017 but are still a best-seller 12 months on. Now more of a promotional give-away than a child’s toy, we have a range of spinners in different shapes, colours and features that we can supply at great prices and on short lead times. Here we look at some of the latest options and creations…………. Our personal favourite, so much so we shall be happy to send you a sample free of charge. Available in 6 bright, clear colours with a full colour print option to both sides of the centre. Prices from £1.70 each. Is there a more practical Spinner? This unique Spinner offers a double-ended bottle opener in six great colours. There is a good print area to both sides with prices from £1.20 each. Fredd is a Multi-functional Fidget Spinner Toy. Three Arms with Centre Point & on each arm is different Fidget Tool including Clickers, Spinners & Ball Bearings. Perfect for controlling stress & fidgeting. Prices from £3.75 each. This a Highlighter in the shape of Fidget Spinner. 3 Neon Fluorescent colours. A desktop idea tha is also a stress reliever. Prices from £3.00 each. This is a 3-port compact USB 2.0 Hub and a Spinner. Available in red, white, blue or black with excellent print options. Prices from £3.15 each. How about a Ballpen and a Spinner in one? Available in green, black, red, blue, orange and white with prices from £3.50 each. Perfect travel combo that combines the Spin-It Widget™ with a charging function. The charging cable comes with a 2 in 1 integrated tip and Type C stored into the storage slot. Available in white, black red and blue with a good branding area. Prices from £4.00 each. 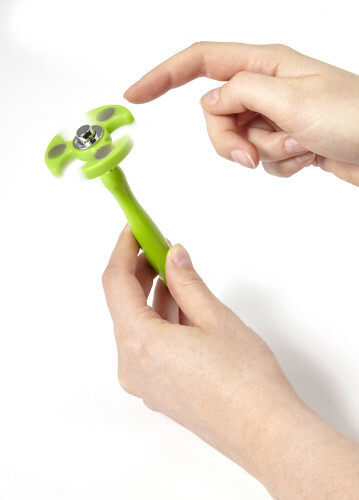 This is the perfect product for stress relief or boredom when your hands need to fidget. The spinner also doubles as a Bluetooth® speaker. This allows you to play with the spinner while playing your favourite song. Simply use the spinner to take your worries away. Micro USB charging cable included. Available in blue, white or black with prices from £10.50 each. This entry was posted in News and tagged Advertising Gifts, Advertising Merchandise, advertising products, branded gifts, branded products, business gifts, Corporate Gifts, Marketing Merchandise Surrey, promotional gift ideas, promotional products, promotional toys, unique promotional gifts.